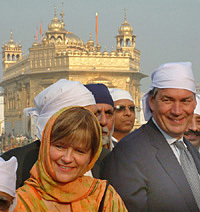 The premier of Manitoba (Canada), Mr Gary Doer, along with 17 of the 45-member business delegation paid obeisance at the Golden Temple here today. The delegation comprised representative of Canadian companies and various institutions to promote and strengthen the existing trade links with India. The Punjab Vigilance Bureau is once again in the line of fire of a senior minister in the Punjab Chief Minister, Capt Amarinder Singh’s Cabinet. Delhi Chief Minister Sheila Dikshit said today that she would make efforts to organise a Heritage festival on the pattern of Patiala Heritage Festival in the Capital. Ms Dikshit, while addressing a function at Sheesh Mahal after inaugurating Patiala Crafts Mela, which is part of the nine-day 4th Patiala Heritage Festival, said for her it was the first big mela she ever visited. An almost full moon paid obeisance to union of the two lovers amidst perfect blend of diverse streams of eastern and western classical arts at Patiala Heritage Festival at the Qila Mubarak here last night. Brig Hasham Khan (retd), Managing Director, Pakistan Tourism and Development Corporation (PTDC), will take up the issue of concession for students in the fare of the Amritsar-Nankana bus service. He was interacting with students of Khalsa College before the departure of the trial bus from youth hostel here today . Victims of 1984 riots who have settled in the district from the other states will be granted Rs 2 lakh as compensation by the Central government. The victims have to file their claims by February 22. This was conveyed by the Deputy Commissioner, Mr H. I. S. Garewal, here today. This information has been passed to SDMs of all sub-divisions to speed up the work, he added. Upbeat over the reprieve he got from Akal Takht, former president of the Delhi Sikh Gurdwara Managing Committee Paramjit Singh Sarna yesterday said he would challenge Mr Parkash Singh Badal on his own home turf, the countryside of Punjab. It was exuberant homecoming for Bollywood actor Om Puri, as he returned to Sanaur village near here, where he had spent his childhood, to be honoured and feted by Punjab Chief Minister Amarinder Singh at a public rally. It was second felicitation for him in the past 24 hours as he had also been honoured last night with a sword and a shawl at the Patiala Heritage Festival. The Punjab Chief Minister, Capt Amarinder Singh, today said he would join the religious procession being taken out by the SGPC in June this year from Tarn Taran to Lahore in connection with the quadricentennial of the martyrdom of fifth Sikh Guru Arjan Dev. The Shiromani Gurdwara Parbhandak Committee has sought permission from the Ministry of External Affairs to allow an SGPC team to visit Afghanistan to assess damage to Sikh gurdwaras there. Many of the Afghanistan gurdwaras had suffered severe damage during the Soviet occupation and the Taliban rule. Sehjra Brigade of the Army and some local NGOs yesterday adopted four physically challenged children from the border villages and decided to provide them free education till Class X11. Residents of the adjoining villages today protested against the opening of an abattoir in their vicinity. They gathered near the industrial area here and vowed to prevent the abattoir from functioning. The Punjab Chief Minister, Capt Amarinder Singh, and the President of the Punjab Pradesh Congress Committee (PPCC), Mr Shamsher Singh Dullo, in separate messages, today extended warm greetings to the people of the state on the 629th Parkash Utsav of Guru Ravi Dass. With a view to checking the flow of silt into the reservoir of the Bhakra Dam, the Bhakra Beas Management Board (BBMB) has entrusted the task of studying the flow of silt to a Nashik-based government institute. Five farmers’ organisations here yesterday decided to launch an agitation to stop the import of wheat ordered by the Union Government. The organisations, which held a meeting on the issue of import of wheat and related matters, will hold dharnas at all district headquarters on February 22, 23 and 24 to mobilise public opinion against the Centre’s decision. Four policemen including an assistant sub inspector, in charge Hakima Chowki Gate falling under C-division police station have been suspended for negligence as two smugglers caught by them escaped from their custody. Two non-residents Indians (NRIs) and their three accomplices were booked by Verowal police station yesterday for fabricating a kidnap story. The accused have been arrested. A constable has been suspended after he barged into the house of a Sekhpura village resident, from whom he had reportedly extorted money, in an inebriated state on Friday. A departmental probe has been ordered against him. Finally the police today registered a case of abduction against a resident of Uttar Pardesh, Ram Dass, on the complaint of Ram Kumar of Kiratpur Sahib town that his minor daughter and son had been kidnapped by other labourers working with him. Bodies of a 40-year-old woman and her daughter were today recovered from a pond at Amarpura Basti here, while three youths and a jail inmate died in separate incidents. A workshop on parenting and child development was organised at Woodlands Overseas School here . The workshop, conducted by Mrs Arvinder J. Singh, permanent consultant trainer and therapist with the United Nations, was aimed at enhancing concentration, problem solving abilities, and creativity among children.